Pour in chicken stock in a large saucepan, and add the chile. Bring to a boil. Add the whole chicken breasts, then lower the heat and simmer for about 12 minutes or until the chicken is cooked. Remove the chicken from the pan and it let cool a little. Shred the chicken into small pieces and set it aside. Cut avocado in half, remove the skin and pit, then chop into 1/2-inch pieces. Add it to the stock, with the chickpeas and scallions. Return the shredded chicken to the pan, add rice, and heat through. Add salt and pepper to taste. Ladle into bowls, sprinkle with grated cheese. If desired, top with cilantro. Serve immediately. 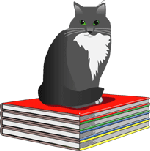 The last thing on Tricia’s mind is food when she hosts an author signing at Haven’t Got a Clue and the author turns up dead. But that kind of trouble makes Angelica want to cook comfort food. Sit down at the table, shake out your napkin, and dig in! Rinse shrimp and set aside. If they’re frozen, defrost them first. Heat butter or oil in large skillet over medium heat. Add garlic; cook 1 or 2 minutes or until softened; do not brown. Add shrimp, green onions, wine, and lemon juice. Cook until shrimp are pink, about 1 to 2 minutes on each side. 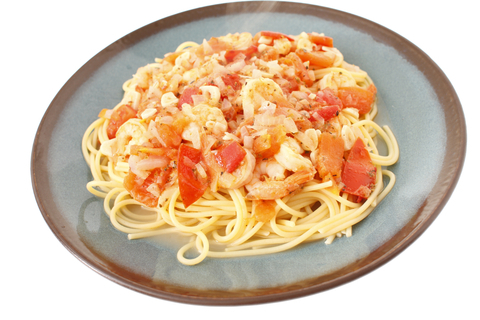 Serve over linguini or your favorite pasta. Sprinkle with parsley as a garnish. Thaw pastry at room temperature for 30-40 minutes. Season chicken with salt and pepper if desired. In a medium skillet over medium-high heat, heat butter; add chicken and cook until browned. Remove chicken from skillet. Cover and refrigerate at least 15 minutes. Unfold pastry and place it on a lightly floured board; roll it out until it is 1-inch wider and longer. Cut pastry in half and layer 1 slice each of cheese, chicken, and ham, and second slice of cheese. Fold over top half to and press the sides closed with your fingers. Repeat the process, making a total of 4 pieces. Bake in 400°F (200°C, Gas Mark 6) oven for 20 minutes or so, until the pastry is puffed and golden. Rub potatoes with oil if desired; pierce with a fork. Bake at 400° for 1 hour and 20 minutes or until tender. Let stand until cool enough to handle. Cut each potato in half lengthwise. Scoop out the pulp, leaving a thin shell. Place pulp in a large bowl and mash it. In a small skillet, sauté onions in ¼ cup butter until tender. 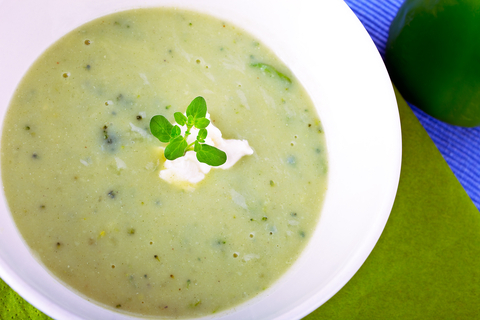 Stir into potato pulp along with half-and-half, sour cream, salt, and pepper. 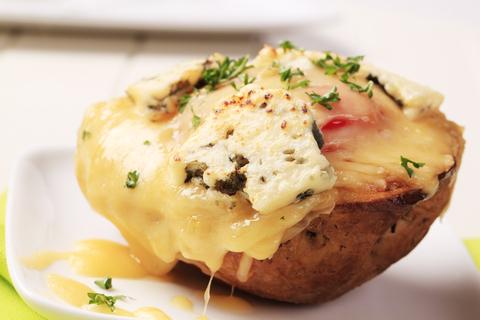 Fold in cheese. Spoon mixture into potato shells. Place on a baking sheet. Melt remaining butter; drizzle it over the potatoes. Sprinkle with paprika. Bake uncovered at 350° for 20-30 minutes, or until heated through. Feel free to add other toppings, such as chopped chives, chopped mushrooms, or crumbled bacon to the mix. Combine flour, baking powder, and salt in a bowl and set aside. Melt butter in a large saucepan over medium-low heat. Add brown sugar and eggs and stir well. Gradually add to flour mixture. Add morsels and nuts, stirring well. (Batter will be stiff.) Spread batter in a lightly greased 13” x 9” x 2” pan. Bake at 350F for 30 minutes. Cool completely in the pan on a wire rack. Cut into squares. In a saucepan heat the cream and bring it to a boil. Remove from the heat. Place white chocolate chips in a large bowl and pour hot cream into the bowl. Let sit for 1 minute or so, then whisk until smooth. Transfer to the refrigerator to cool, stirring occasionally. When mixture is cold and thickened, beat with an electric mixer into soft peaks, then beat the last few strokes by hand with a whisk until thick and firm. Do not over whisk or mixture will become grainy. For flavored ganache, use 1 ounce less of cream and add 1 ½ ounces of rum or your favorite liqueur. Or add ¼ teaspoon vanilla extract, or other flavoring. Ganache can stay at room temperature for 2 days, as long as it’s kept in a cool place. In a large bowl, cream together sugar and shortening until fluffy. Add eggs and vanilla. In a separate bowl, mix flour, soda, and baking powder. Alternate adding buttermilk and dry ingredients to the creamed mixture. Divide dough into 4 equal pieces. Roll out a portion on floured surface to ¼ inch thickness. (To keep dough from getting tough, use confectioner’s sugar instead of flour.) Cut out with your favorite cookie cutters. Place on lightly greased or nonstick cookie sheets or parchment paper-covered baking trays. Bake at 350F for 8-10 minutes, until they just start to brown. Cool completely in pans for about 5 minutes, transfer to cooling/wire racks, and cool completely before decorating. In a small bowl, mix sugar and water to form a thick, smooth icing. Stir in food coloring to reach desired shade. Use separate bowls for additional colors. 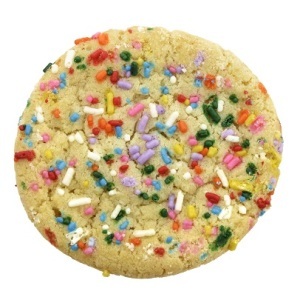 Frost cookies. Add sprinkles before icing dries. Cream shortening; beat in sugar gradually. Add eggs, one at a time; beat well after each addition. Make a paste of cocoa and food coloring; add to creamed mixture. Add salt, flour and vanilla alternately with buttermilk, beating well after each addition. Sprinkle soda over vinegar; pour the mixture over batter. Mix well. Bake in 3 prepared 8-inch pans or 2 9-inch pans for 30 minutes at 350°, or until toothpick tester comes out clean. In a large mixing bowl, combine frosting ingredients; beat until smooth and creamy. Spread between layers and over top and sides of cake. 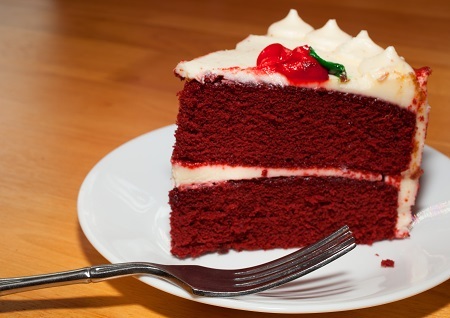 You can color your cream cheese frosting with red food coloring, or make your own “stage” blood. 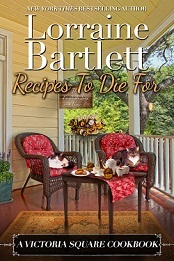 Lorna’s alter-ego, Lorraine Bartlett, has written a cookbook: Recipes to Die For (A Victoria Square Cookbook), featuring the characters and their favorite foods and drinks from the Victoria Square Mysteries. Lorna/Lorraine posts every Friday on the Cozy Chicks Blog. 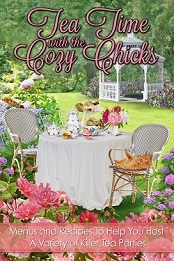 The (collective) Cozy Chicks have published two cookbooks, The Cozy Chicks Kitchen and Tea Time With The Cozy Chicks. 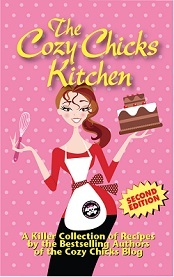 Click this link for more information on these terrific cookbooks, containing recipes from the Chicks’ and their characters.